The former Spice Girls singer filed for divorce from the film producer in March (17) after almost ten years together and during their bitter divorce battle, Stephen asked for spousal support, claiming he has no income, has serious credit card debts, and is so poor he can't afford somewhere to live after being kicked out of their marital home. 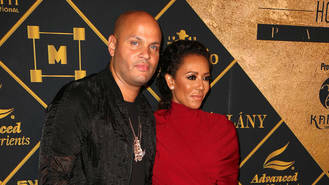 A judge was due to rule on the spousal support issue recently but he decided to push the hearing back after siding with Mel's lawyers, who insisted it's too early to discuss their money, according to TMZ.com. They claimed Mel has incurred expenses due to the restraining order she obtained against him and she is yet to discover if Stephen may need to cover some of that bill. They requested a continuance on the ruling and it was approved so the hearing will now take place at the end of June. Stephen had also asked for Mel to cover his legal bills, previously putting in a request for her to pay him $200,000 (£150,000) towards his legal bills so far, and another $55,000 (£40,000) to pay his accountant. She obtained a restraining order claiming he was abusive during their marriage and another against their former nanny Lorraine Gilles, who Stephen reportedly had an affair with and got pregnant. The TV judge asked for sole custody of their five-year-old daughter Madison while Stephen asked for joint. He was eventually given visitation rights and is allowed to see her in two four-hour supervised sessions per week at the Ness Counseling Center in Los Angeles. According to TMZ, he has asked for the location to be changed as paparazzi have been taking pictures of Madison. A hearing will take place over that issue next week (beg12Jun17).